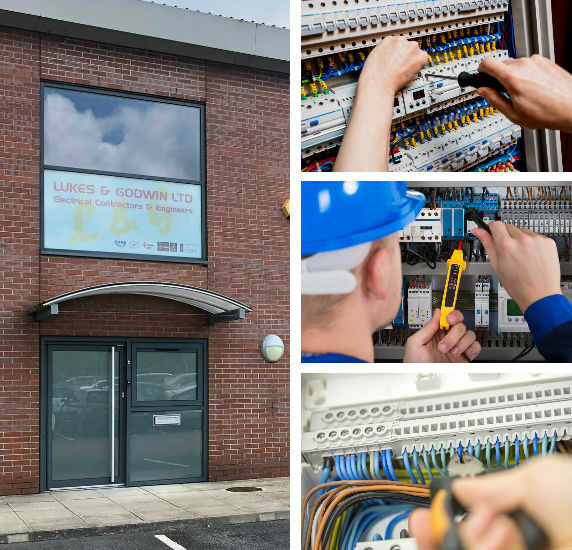 Lukes and Godwin Ltd Electrical Contractors and Engineers are highly-experienced and have been installing excellent quality electrical work since 1968. We are a well-established, respectable and professional company that specialises in electrical design and installation for the domestic, commercial, industrial and retail fields. Whatever the size of the job, our professional team can handle it. We’re certified by the NICEIC (National Inspection Council for Electrical Installation Contracting) and we pride ourselves on being one of the first to gain UKAS (United Kingdom Accreditation Service) accreditation. We are also certified NICEIC Domestic Installers, and other certifications include; Construction Line, Considerate Constructors and CHAS (Contractors Health and Safety Assessment Scheme). Our staff are all currently working to the most recent edition of the Wiring Regulations and hold ECS (Electrotechnical Certification Scheme) cards, which validate their competency and skills. And as some of our work is very sensitive, all of our staff have undergone an enhanced DBS check. What does all that mean for you? You can be sure that all of our staff are fully-trained, and meet industry and safety standards, ensuring that all of our work is properly done and that we keep our customers and our staff safe. You’ve also got complete peace of mind that any of our staff visiting your home or place of work have had a thorough criminal records check, and that your property and any sensitive materials in your business are completely safe with us. We currently have contracts to the value of 1m, and can handle any size of job, from simply fitting a new wall socket at home to rewiring an entire industrial plant, and we employ 30 qualified electrical tradesmen and women, including apprentices, bringing a wide range of skills and experience to our business. We have recently relocated, and you can now find us on Oakham Business Park on the outskirts of Mansfield, Nottinghamshire. Lukes & Godwin’s strength lies in our growing experienced, highly-qualified and competent workforce, and we’re here for you 24/7, for any size of job. Are you looking for a professional team of electrical contractors? Lukes and Godwin Ltd are a team of fully-qualified electrical tradesman, all registered through the Competent Persons Scheme from NICEIC. We pride ourselves on our high-quality workmanship and 100% positive feedback from our delighted customers. If you would like to hear more about our services or how we can help you with your electrical project, get in touch with us today!